You have so many choices when it comes to the flooring in your home. You can never go wrong with choosing hardwood floors. 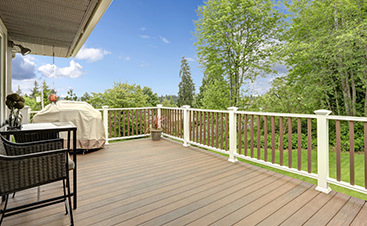 They offer many advantages ranging from aesthetics to durability, and everything in between. However, once you choose to go with hardwood, you are still not done making decisions. The next choice you have to make is between prefinished or unfinished hardwood floors. Each type of hardwood flooring has its distinct advantages and disadvantage, so it is important to have as much knowledge as possible so you can make the decision that works best for you. 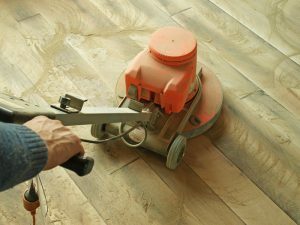 The following information will help you learn more about prefinished hardwood flooring vs. unfinished hardwood flooring. Many people opt for prefinished hardwood floors because they have a variety of desirable features. Consider some of the reasons why they are a top choice. 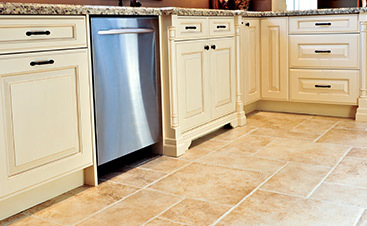 Floors that are made of any material can easily fall victim to scuffs and scratches. Floors are constantly being walked on, not to mention they must bear the weight of furniture. People also often drag items across the floor to move them from one place to another. All of this activity is potentially hazardous for a floor. Therefore, you want one that is made from durable materials that will stand up to normal wear and tear as well as any extra abuse a family can throw at it. Prefinished hardwood flooring is much stronger and more scratch-resistant than its unfinished counterpart. The added strength is due to the multiple coats of polyurethane it receives in the factory as well as a coating of aluminum oxide, which is the world’s second hardest substance. Purchasing prefinished hardwood flooring is far less messy than buying unfinished wood and finishing it yourself. Prefinished flooring is ready to install upon its arrival to your home. On the other hand, unfinished wood needs to be finished first. This requires lots of sanding, which produces lots of sawdust. Also, finishing the wood can produce some noxious odors. The smell can linger in the air for days, even if you keep all of the windows open and run fans while you are working. Laying down prefinished hardwood flooring takes far less time than installing unfinished hardwood does. Most prefinished flooring jobs can be completed in a few days, and you can walk on the floor immediately after it is laid down. When you start with unfinished hardwood, you have to finish the wood and allow it time to dry completely, which can take as many as five days. During this time, you cannot walk on the floor. There are also consumers that choose unfinished hardwood floors. Consider the reasons why they are also a viable option. Most prefinished hardwood floors come with a beveled edge. Some homeowners prefer this look because it seems more natural. However, others like a smooth edge because it gives a cleaner, more finished look. One problem with a beveled edge is that dust and dirt have a tendency to get caught under it. 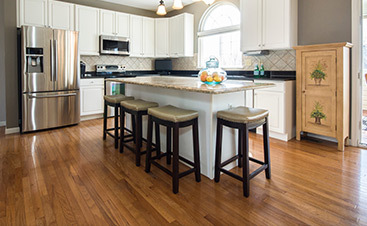 Hardwood floors that are finished on-site rather than in a factory are more resistant than prefinished floors. This feature is particularly beneficial in the kitchen where spills and drips are frequent. It is incredibly difficult to perfectly color-match new prefinished hardwood floors to floors that are already present in the house. If you have different colored hardwood floors throughout the house, it produces an unfinished look, particularly if the shades are similar. You could end up with floors that look like you attempted to match the colors but failed. However, when you start with unfinished wood, it is much easier to match the stain to what you already have in the house. When you purchase prefinished hardwood for a floor, you are limited to whatever shades the store has in stock. Also, you will not have the option to try it out to see what it looks like in your home. You could end up with something you loved in the showroom that just does not work in your home. Working with unfinished hardwood gives you more options. You can mix different stains together to create a unique look. You can also sample a few different shades on different planks to see what works best in your home with your lighting and furniture. Since you are able to experiment and try different samples, you are guaranteed to love the final product once it is laid down in your home. Unfinished hardwood flooring usually costs less than prefinished hardwood does. As a rule of thumb, the wider the planks are, the bigger the difference in price between prefinished and unfinished flooring. When you need to make a decision about your flooring, take into consideration the factors that are most important to you. Whether you decide to go with prefinished or unfinished floor planks, the most important factor is that you are happy with the final product. Contact a professional to learn more about the right flooring for your unique needs.